Greek Defense Minister Panos Kammenos resigned today as result of the push to ratify the Prespa treaty that renames Macedonia into North Macedonia in exchange for Greece ending its veto for Macedonia’s NATO and EU membership. This deal is a capitulation. It recognizes the artificial creation of Mussolini and Tito and perpetuates a lie created by Communism and Fascism, the nationalist minister said speaking about Macedonia. 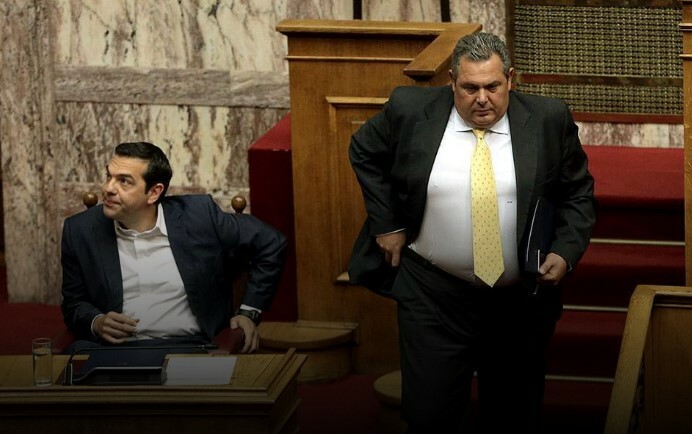 Kammenos has announced for a while that he will resign if the treaty is sent to the Greek Parliament for approval. He refused to leave the Tsipras Government as the talks were on-going, but he did cause the resignation of Foreign Minister Nikos Kotzias, accusing him of bribing Macedonian politicians and journalists with public funds in order to get them to agree to the deal. Prime Minister Alexis Tsipras said he will replace Kammenos with Chief of Staff Evangelos Apostolakos, and that the vote of confidence in the Government will be held next week. Tsipras expressed hope that he will serve out the remainder of his term and that elections will take place in the regular term in October. Kammenos called on his group in Parliament to vote against the Government, even specifically addressing a representative by name. His nationalist ANEL party lost several officials in the past months and it is still unclear whether Kammenos will be able to get it to vote it his way. Without the ANEL votes, Tsipras doesn’t have majority in the Parliament. The centrist To Potami party said it will provide him the votes he needs to ratify the Prespa treaty, but would not vote to keep his Government in office.